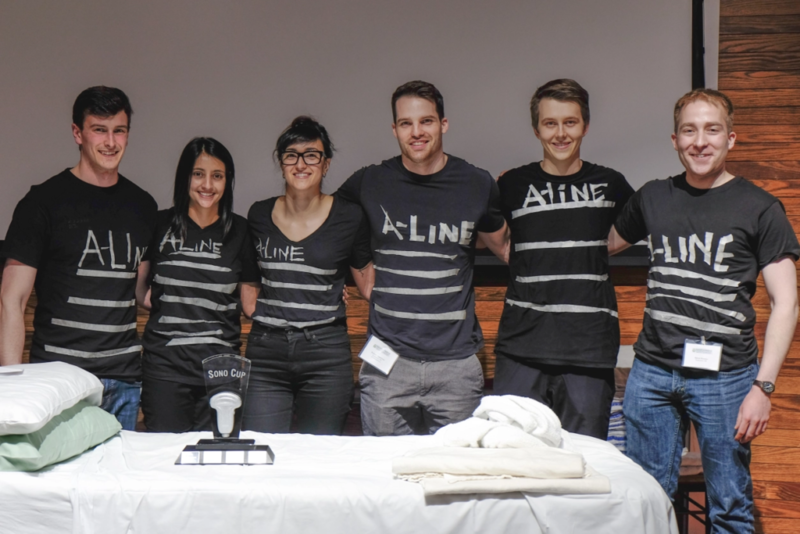 The SMSS has over 20 ratified student groups with a number of diverse interests – from Medical Education, to Surgery and Surgical Skills. To operate a student group that provides meaningful insight and learnings to/for students effectively is no small task. Therefore, we have provided some information for prospective groups, new groups, and returning favourites! We look forward to cooperating with you! We are excited to see your interests inspire others, and hope we can help! Becoming a ratified SMSS Student Group has many benefits: the ability to post your group’s events to the SMSS Website’s Events Calendar, the potential to have your ideas and events funded through our Student Groups budget, access to help booking rooms, fundraising, and running a club, and the invitation to participate in the Fall Student Groups Fair and discussions with your fellow Student Group executives at our SMSS Round Table Meetings. Before we can help you reach the SMSS membership, we need to know a little more about your group and your ideas. We hope the following resources will prove helpful and should you need any further guidance, the Student Groups Coordinator (SGC) is happy to help. You will need to provide us with a list of your group’s leadership team as well as how you plan to function as a group (i.e. a Group/Club constitution). For guidance on creating this kind of a document, see the Constitution example document or contact the SGC. 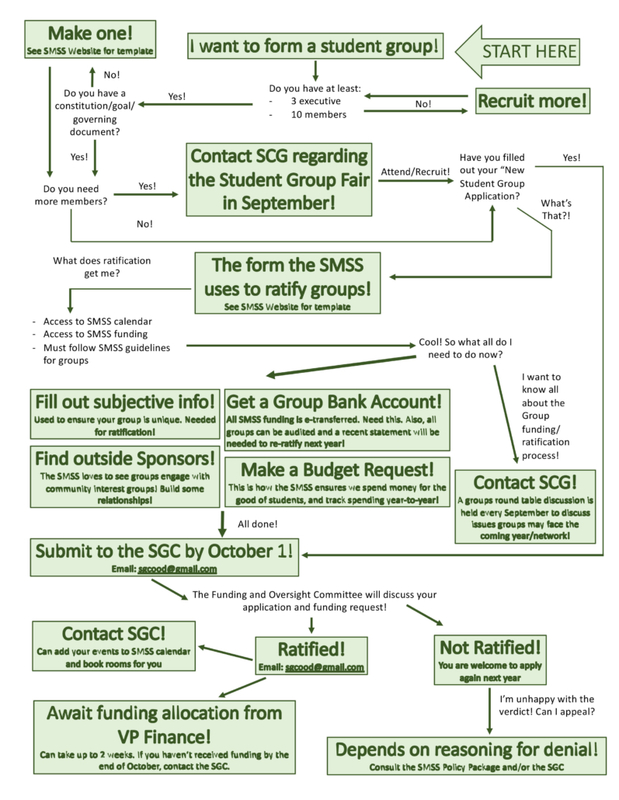 In accordance with the SMSS Governing Documents (Funding and Oversight Policy and protocols), Student Groups are ratified by the Funding and Oversight Committee, which is chaired by the SGC. Please complete the New Student Group Application Form and email it to the SGC before the deadline (Email the SGC for the deadline date). This will ensure that the Committee can ratify your group and get you funds so you can start putting your plans into action and open up membership opportunities to the SMSS members. NOTE: Failure to FULLY COMPLETE the application form WILL result in your application being dismissed. At least one Leadership team member from all Ratified Student Groups are required to attend both the Roundtable discussions between student groups (In September and January). Furthermore, the SMSS holds a lunch-time Student Groups Recruitment Fair for the incoming class in September; a great opportunity to talk to like-minded students. Once ratified, the SGC will provide information to your group on this. Student Groups must be ratified each year. This occurs at the first Funding and Oversight Committee meeting of the school year (August or September). In order to be ratified as a returning Student Group, you will have to fill out the Returning Student Group Ratification Form – which outlines the budget, spending, and successes from the previous year. Therefore, it is imperative that you keep a good budget and fill out Expense Claim forms as the year passes. For assistance with this, please contact either the SGC or VP Finance (treasurer.smss@gmail.com). NOTE: the Funding and Oversight Committee reserves the right to audit ratified Student Group budgets. Welcome back! The SMSS Executive and Funding Committee have been working on updating our Student Group documents and the processes we use to ratify and fund the Groups. Please refer to the Returning Student Group Application Form and email it to the SGC before the deadline (Email the SGC for the deadline date). This will ensure that the Committee can ratify your group and get your funds in order. Please be advised that it is now MANDATORY that all ratified Student Groups must participate in both Roundtable Discussions and the Student Groups Recruitment Fair. Please also be advised that failure to FULLY COMPLETE the application form WILL result in your application being dismissed. Any questions and/or concerns should be directed to the SGC. NOTE: the Funding and Oversight Committee reserves the right to audit ratified Student Group budgets.